Because we live in such a hot and humid area, it makes sense that you might give your air conditioner more frequent thought than you do your home heating system. That doesn’t mean that your heater is not just as important as your AC, though. 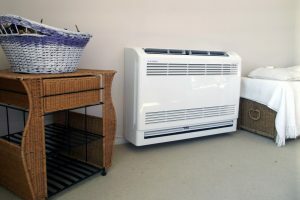 If you are serious about living comfortably all year long, then you need both a great heater and an AC installed, regardless of how much you may use one or the other. Of course, you could also opt to have just one system installed that will handle both your heating and your cooling needs. We’ve talked previously about how heat pumps are able to provide both heating and cooling, and today we are going to focus on a variation of that theme: the ductless mini split. Read on to learn more about why you may want to skip the ductwork when heating and cooling your home. So It’s Like a Window Unit? Or a Space Heater? No, not really, a ductless mini split system is still a whole-house comfort system. It just doesn’t require air ducts in order to distribute heated and cooled air throughout the house. Instead of using air ducts connected to a central air handler, a ductless mini split uses individual, wall-mounted blowers in order to heat and cool the rooms in which they are installed. They are heat pumps, and capable of reversing their operation by reversing their refrigerant cycle, just like the traditional air-source heat pumps that we’ve discussed previously. While most homes in our area have central air conditioning systems using ductwork, the fact is that those air ducts can actually lead to some problems. They can leak, which allows air to escape and wastes energy. That also allows pollutants to make their way into the ductwork, and they can then be distributed throughout the entire house via the ductwork. Ductless mini splits in Brooksville, FL, also let you easily maintain different temperatures in different areas of your home, allowing for simple zone control. Plus, they are great for retrofitting into existing properties. If you’d like to learn more about ductless mini splits, just give us a call. Bayonet Plumbing, Heating & Air Conditioning is here for your heating and cooling needs.